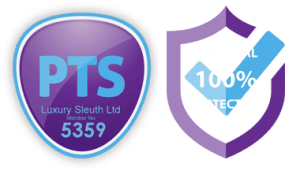 Luxury Sleuth Limited (LS) trading as Luxury Rallies, Grand Car Tours and Journeys of Distinction arranges rallies, car tours and holidays upon the following terms and conditions. Most of the rallies, car tours and holidays comprise a package rally, car tour or touring holiday, within the meaning of the Package Travel Regulations 1992, where they include overnight accommodation AND a travel element. Some of the packages that do not include these elements are classed as events and do not fall within the terms of the Package Travel Regulations. Where the rallies, car tours or holidays fall within the Package Travel Regulations 2013, consumer protection is provided by Protected Trust Services, who hold customer funds in trust to meet the obligations required by the regulations by holding the customer funds in a trustee account and providing supplier failure cover for the suppliers of the holidays. Regarding the requirement for a valid passport for overseas travel. We highly recommend you take out insurance cover for any cancellation of booking by you and provision for available insurance to cover emergency risks and accidents whist driving overseas. Luxury Sleuth (LS) arranges rallies, car tours or holidays and tours including but not limited to flights, transfers, excursions by coach, train, ferry, taxi, private car, boat and or air for the purpose of creating a rally, car tour or holiday. We also use the services of hotels, services and guides to supply part or all of the rally, car tour or holiday or tour. For the purposes of this document – they are all referred to as ‘Travel Providers’. All aspects of the booking process and the booking and delivery of the Rally, car tour or holiday are based upon the following terms and conditions. These terms and conditions set out the terms on which Luxury Sleuth Limited (“Luxury Sleuth”, “we”, “us” or “our”) provides travel arrangements through our websites (www.luxuryrallies.com, www.journeysofdistinction.co.uk ), as well as over the telephone, known collectively, the “Services”). The rally, car tour or holiday although defined as a ‘rally’ does not imply any competitive element. Each participant must abide by the local speed limits and laws of the country in which he or she is driving. Any advice given by LS in no way implies any liability by LS. If you are provided with a satellite navigation device which has a pre-programmed route encoded within it. This is merely for the purpose of indicating our recommended route, following this route in no way implies any liability upon LS or for the route, the road conditions, route suitability or and damage or costs incurred by following this route. We highly recommend you take out sufficient insurance cover for any cancellation of booking by you and provision for available insurance to cover emergency risks. We do arrange RAC European Cover for the rallies, but this is supplemental to your own arrangements. Your booking and your contract is with Luxury Sleuth (Luxury Sleuth Limited). Your booking may also be subject to the terms and conditions of the Travel Providers, a copy of which is available from us upon request. 1.2 A contract will only come into existence between us when you have paid the deposit on booking. You acknowledge that by booking with us, you will be under an obligation to pay for the rally, car tour or holiday booked by you. “Booking” means any placing of a request by you, in person, in writing or by telephone, for you or someone else to be included in a rally, car tour or holiday, either direct to Luxury Sleuth or through any agent, together with full, cleared deposit payment for the tour or holiday, as communicated. 1.3 When you receive documentation for your rally, car tour or holiday, please ensure you check that all personal details are correct and in the event that the rally, car tour or holiday involves travelling abroad, that they match the names and ages on the passport(s). If this is not the case, please contact LS within 24 hours otherwise charges may apply. 1.4 You must keep the contact details we hold for you up-to-date so that either we or the Travel Provider can contact you if necessary about your Rally, car tour or holiday. 1.5 If you have a medical condition which may affect your booking, please let us know before confirming a booking so we can find out if the rally, car tour or holiday is suitable. 1.6 The booking confirmation allows you to check and amend any errors before submitting your booking for a rally, car tour or holiday. Please take the time to read and check your booking confirmation – which is the definitive article of what you are being asked to pay for and should include all aspects of the Rally, car tour or holiday. It is your responsibility to ensure that all the details on the booking summary are correct. If we do not hear from you within 24 hours we shall assume that you accept all the details as set out in the booking summary and that you agree to abide by these terms and conditions. 3.0 Please note that we can provide general information about the passport and visa requirements for your trip, but your specific passport and visa requirements, and other immigration requirements are your responsibility and you should confirm these with the relevant embassies and/or consulates. Any information supplied by us on these or related matters (such as climate, when to travel, clothing, baggage, personal items etc.) is given as general guidance and in good faith but we do not accept liability for any decisions made on the basis of the information supplied. 3.1 Certain countries require vignettes or toll fees for use of the roads in that country, the toll fees are entirely the liability of the customer. LS will on occasions supply vignettes as a matter of course. This does not imply any liability upon LS to supply these. Nor does it imply any liability upon LS for the non-supply of such items or for the incorrect display of such items. It is the responsibility of the participant to ensure the vignette is collected from staff and displayed correctly. 3.2 The passport, visa and health requirements at the time of booking can be viewed on the Foreign and Commonwealth Office website (www.fco.gov.uk). It is your responsibility to ensure that you and all members of your party are in possession of all necessary travel and health documents, your GP should also be aware of the latest vaccination requirements. You must ensure you are in compliance with any other immigration requirements, before you travel. Neither we, nor the Travel Providers, accept any responsibility if you cannot travel or participate in an activity because you have not complied with any passport, visa or immigration requirements. Please ensure that all your travel, passport, visa and insurance documents are in order and that you arrive in plenty of time for checking in at the Eurotunnel or ferry, we will endeavour to make sure that sufficient time is allowed for you to arrive in good time, but the ultimate responsibility with this lies with you the customer. 3.3 For certain rallies, car tours or holidays we will offer a luggage carrying service. Whilst we will make our best endeavours to ensure this is safely collected, logged and transported without damage, we do not offer any guarantee of the safety and secure transportation of luggage. We expect you to ensure there are no dangerous or flammable substances within the luggage. We do not have insurance for the carriage of customer’s luggage. 4.1 In order for you to participate in a rally, car tour or holiday sold by us, you must make a booking. This is done by paying a deposit depending on the total advertised price. It is your responsibility to ensure that the booking and the rally, car tour or holiday is suitable for your requirements and capacity (including your physical and medical state and any disability from which you may suffer), in every respect. 4.2 Provided that a place on the rally, car tour or holiday booked is available and LS is satisfied that there is no good reason to refuse the booking, LS will confirm the booking in writing. You must then pay partial balance 50% of the full amount owed minus the deposit payment 24weeks prior to the tour, then the full balance of the tour price within 12 weeks of date of the tour. At that point, and not before, the Booking is complete and a contract is then made for the provision of the rally, car tour or holiday. If, for whatever reason, a booking is cancelled by you, LS will not make a refund of the booking payment made by you – we reserve the right to charge an administration fee. 5.2 We may incur costs in cancelling confirmed bookings. For example, the arrangements we enter into with our Travel Providers may be non-refundable. Accordingly, even if you cancel your booking in advance of travel, we may still have liabilities to pay the Travel Providers. In these circumstances, where you cancel your booking with us, you will be charged a cancellation fee per person which reflects the losses and costs which we incur (or have incurred) in cancelling the booking. We also reserve the right to charge an additional per person administration charge which we will inform you of before processing the cancellation. If you have already made a payment to us, we will deduct these charges from the payment already made to us before returning the balance to you or, where that payment is not sufficient to meet our liability, you agree to pay us the additional sum. If you have made payment in full this is presumed as full commitment to partaking in the tour and as such it is likely that there will be no refund of any monies. In any circumstance if the final balance payment date has passed and full payment has not been made, the customer may forfeit any monies already paid and LS are under no obligation to hold a place on the tour. To be clear, no monies will be refunded once the final payment date has passed unless the tour is fully booked and we can resell the place onto another customer. 5.3 As the arrangements which make up your rally, car tour or holiday are planned many months in advance, from time to time we may need to make a change to your purchased rally, car tour or holiday. We reserve the right to do so at any time. Most changes are minor changes; however, occasionally we have to notify customers of a “significant change” that we must make to a rally, car tour or holiday. A significant change is a change made before the start of the rally, car tour or holiday which, taking account of the information given to us at the time of booking and which we can reasonably be expected to know, we can reasonably expect to have a major effect on your purchased rally, car tour or holiday. 5.4 Significant changes are likely to include the following changes when made before departure; a change of accommodation to that of a lower official classification or standard for the whole or a major part of the time you are away*, a change of accommodation area for the whole or a major part of the time you are away, a change of UK outward departure time or overall length of time you are away of 24 or more hours, or a change of UK departure point to one which is more inconvenient for you (except as between Gatwick and Heathrow). *Please note: A change affecting a stay in a hotel or facility during a rally, car tour or holiday where the hotel or facility itself is not the focus of the rally, car tour or holiday, does not constitute a significant change. If we have to make a significant change or cancel, we will tell you as soon as possible. (b) purchasing an alternative rally, car tour or holiday from us, of a similar standard to that originally booked if available. Please note: Due to the original and individual nature of our rally, car tour or holiday it frequently may not be possible to offer you a comparable rally, car tour or holiday to that originally booked. 5.5 Any cancellation by you of a booking must be made in writing to LS. The booking deposit is not repayable and there could be cancellation fees due from the Travel Providers. If these exceed the amount of monies paid as deposit, we will seek the balances to be paid or will negotiate on your behalf with any of the other parties to minimise amounts due. If you wish to cancel or make a change to your purchased rally, car tour or holiday, then LS may, at its sole discretion, use reasonable endeavours to assist to liaise with the Travel Providers to arrange cancellation or make the required change. Luxury Sleuth gives no guarantee that any such attempts will be successful. The Travel Provider may charge a cancellation or amendment fee (as shown in their terms and conditions), which may be as much as 100% of the cost of the travel arrangements. 5.6 Although it is rare for us to do so, occasionally we may need to cancel a confirmed rally, car tour or holiday. We reserve the right to do so at any time. 5.7 For the avoidance of doubt, in the event that only one element of a rally, car tour orholiday is cancelled or significantly changed (save for cases of Travel supplier insolvency), this will not entitle you to a refund for the element that has not been cancelled or changed although we will use our best efforts to get a refund from the Travel Providers on your behalf. 5.8 If we have to make minor alterations to your itinerary travel or rally, car tour or holiday arrangement, we reserve the right to do so. 6.3 If we agree to make a change, we reserve the right to apply a per person administration charge (the amount of which will be notified to you at the time of making your request) for the making of your required change plus any cost we incur in making the change (including, without limitation, charges which are imposed on us by the Travel Providers for making the change). This could be substantial and such costs tend to increase the closer to the departure date that the change is made. For instance, certain elements of the rally, car tour or holiday (e.g. a flight) may incur a 100% cancellation charge. 6.4 If any person on a Rally, car tour or holiday is prevented from travelling, we will agree to that person’s booking being transferred to another person who satisfies all the conditions applicable to the Rally, car tour or holiday, subject to both persons accepting joint and several liabilities for full payment of the Rally, car tour or holiday price and the charges as detailed in the booking confirmation. There may be administration and revised documentation fees as well as transfer charges which we will inform you of as soon as possible after the transfer request is made. 6.5 We must be given reasonable notice of a transfer request, which is considered to be at least 7 days prior to the departure date. 8.1 You agree that you may be photographed in the course of the rally, car tour or holiday or tour for the purpose of LS publicity and that any written comments you make about the rally, car tour or holiday or tour or LS may be published by LS. 8.2 You agree to abide by any reasonable directions (especially any given on account of health and safety), given by LS’s representatives in the course of the rally, car tour or holiday. 8.3 You agree to behave in a reasonable and responsible manner and, in particular that you will do nothing which might endanger the health and safety of any person involved in the rally, car tour or holiday or which might result in personal injury to any person or loss of or damage to property belonging to LS, its representatives or other Clients. 8.4 You agree that it is your responsibility to carry any necessary valid passport or visa, necessary for the rally, car tour or holiday and, in any event even for domestic tours, always to carry some official means of photographic identification, such as a valid driving licence. 8.5 You agree to inform us of any special requests at the time of booking. We will advise the relevant supplier of such requests but cannot guarantee that they will be met. Furthermore, LS has no liability to you if such requirements are not met. 9.1 When LS supplies ancillary services, which include any services supplied by a third party, LS does not give any warranty or guarantee as to their quality, fitness for purpose or otherwise but shall, where possible, assign to you the benefit of any warranty, guarantee or indemnity given by the person supplying those services to LS. 9.2 LS shall have no liability to you for any loss, damage, costs or expenses or other claims for compensation arising from any instructions supplied by you which are incomplete, incorrect, illegible, out of sequence or in the wrong order or form, or arising from your late arrival, non-arrival or any other fault of yours. 9.3 Except in respect of death or personal injury caused by the negligence of LS, or as expressly provided in these Terms, LS shall not be liable to you by reason of any innocent representation or any implied warranty, condition or other term, or any duty at common law, for any loss of profit, opportunity or any indirect, special or consequential loss, damage, costs, expenses or other claims (however caused) which arise out of or in connection with the provision of any transfer or tour (including any delay or failure to provide it), so however that, the entire liability of LS under or in connection with the tour contract shall be limited in maximum to the amount of the payments for the provision of the transfer or tour in question. 9.4 LS is not responsible for any act or omission of yours which results in death, personal injury or loss of, or damage to property of any other client. 10.2 It is a condition of booking that all travellers be covered by comprehensive travel insurance and do not travel against medical advice. You should organise travel insurance immediately after booking so as to be covered in case of the ill health of yourself, a close relative or your travelling companion/s. 11.1 LS shall not be liable for any breach of its obligations resulting from causes beyond its reasonable control including fire, natural disaster, war or military hostilities and strikes of employees. It does not include merely inclement weather conditions. 14.1 We reserve the right to increase the price of your rally, car tour or holiday after you have booked but no later than 30 days before the departure date stipulated and will forward an amended invoice reflecting any changes made. After an invoice has been sent to you, any increase to your rally, car tour or holiday price will be as the result of changes in our costs of supplying your rally, car tour or holiday resulting from transportation charges, (fuel, airport charges, scheduled air fares and other transport charges which form part of our contract with the transport provider), currency fluctuations and government action. An administration charge is included within these amounts. 14.2 If the increase would be 2% or less of the Rally, car tour or holiday price shown on your invoice (excluding insurance premiums and any amendment charges), we will absorb the changes in our costs described above and will only pass on any increase above that level. 14.3 We will do our very best to hold the price of your booking. If the increase is more than 10% of the rally, car tour or holiday price and we feel a supplementary payment is justified and necessary to fulfil your booking, you will be notified in writing and supplied a supplementary invoice. Should you instruct your credit/debit card company to “charge back” any payment(s) properly due from you in respect of your booking, we will charge you a fee of £100 per incident and associated costs. We further reserve the right to cancel your booking and/or take legal action against you for all outstanding payment(s). 14.4 The price you are given will be correct at that time, based on current prices and exchange rates. Prices are not guaranteed and not confirmed until the point of full payment. Upon payment being received in full, your rally, car tour or holiday price will not change, unless you make amendments to it. Please note, the information and prices shown on our website, in our flyers and/or quotations may have changed by the time you come to book your rally, car tour or holiday. Whilst every effort is made to ensure the accuracy of the website, brochures, quotations and prices at the time of publishing or when they are sent to you, regrettably errors do occasionally occur. You must therefore ensure you check all details of your chosen Rally, car tour or holiday (including the price) with us at the time of booking. If Luxury Sleuth fail to comply with these Terms and Conditions, we will be responsible for the loss or damage you suffer that is a foreseeable result of our breach of these Terms and Conditions or our negligence, but we will not be responsible for any loss or damage that is not foreseeable. Loss or damage is foreseeable if the loss or damage was an obvious consequence of our breach or if the loss or damage was contemplated by you and us at the time we entered into the contract.